Engineering education is taking a new mode as AICTE, the apex body for technical education, is coming up with the model curriculum. Today, the hot news topping the higher education sector is the revision of the curriculum, which will be adopted by over 3,000 engineering institutions in the country. The model curriculum insists in the inclusion of social sciences including management, Indian culture and Constitution in engineering from the next academic session. But, this seems to be a very valid point because engineering is all about creations for the societal benefits. In order to engage in these, definitely students need the awareness about the society and the challenges within it. Further, the emphasis is also laid on cutting the theoretical classes from 30 to 20 every week. New curriculum ensures that students get their final semesters to pursue project works understanding the industry requirements. For the first year students, technology is given prominence by adding big data analytics, artificial intelligence, robotics and internet of things. The remoulding of engineering education is the result of the surprise visits held by AICTE over the professional colleges wherein so many flaws came to limelight including the deficiencies in faculty to infrastructure. This remodelling is expected to bring about more employable graduates as the curriculum is trying to cover all the necessary fields. The mandatory induction programmes and the internships stand as the highlights of the revised curriculum. Currently, the country is also facing the problem of oversupply of engineers. As the approval was given to in-numerous engineering institutes without having the proper check, engineering colleges got a good count as a profitable business. This resulted in making quantity more than quality that eventually affected the placements. Data on campus recruitments of engineering colleges reflect that the students of Indian Institute of Technology (IIT) and the National Institute Technology (NIT) and few others only could receive good placements indicating an upward turn in job market. So, now it seems to be the right time for a radical move in the engineering education field. As the academic session of 2016 -17 ends, lakhs of class 12 students across India are in the preparation mode to appear for the various engineering entrance exams. This issue of higher education review intends at helping these students to shortlist the colleges they apply for as we come up with the best private engineering colleges in India. 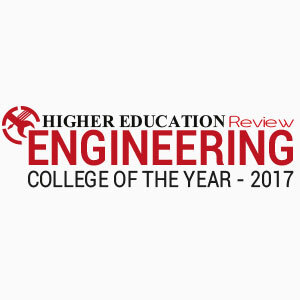 The expert panel have listed the topmost colleges based on their qualitative teaching and innovative curriculum as "Engineering College of the Year 2017."